MWC 2019 is set to be chock full of surprises, and Qualcomm is here to kick-off the party with the announcement of the 7-nanometer Qualcomm Snapdragon X55 5G modem. It’s the world’s first 7 gigabits per second (Gbps) 5G modem and is a successor to the world’s first 5G modem in the Qualcomm Snapdragon X50, which was announced way back in 2016. It not only supports from 5G to 2G connections, but it also supports 5G New Radio (NR) mmWave and sub-6GHz spectrum bands. The 7Gbps rated bandwidth is in relation to download speeds, while it’s rated for 3Gbps upload. “Qualcomm Technologies is spearheading the first wave of 5G launches with our first generation 5G mobile platform. With significant evolution in capabilities and performance, our second generation commercial 5G modem is a true testament to the maturity and leadership of our 5G technology. We expect our 5G platform to accelerate 5G commercial momentum and power virtually all 5G launches in 2019 while significantly expanding the global 5G rollout footprint,” said Cristiano Amon, president of Qualcomm Incorporated. So why do we need the Qualcomm Snapdragon X55 modem? The Qualcomm Snapdragon X50 is perfectly capable of even 5Gbps, but that doesn’t mean it’s good enough for 5G in practice. Qualcomm is trying to avoid many of the pitfalls that were faced when 4G first launched. Due to a lack of optimization, the battery life of devices on 4G networks was terrible and signal reception was poor. The Qualcomm Snapdragon X55 is specifically designed with power-efficiency in mind, supporting adaptive tuning for sub-6GHz connections which should also result in better indoor coverage. It’s built on a 7nm process, too. The Snapdragon X55 5G modem also boasts ease of integration into any system, with the company claiming that the Snapdragon X55 modem can connect to virtually any 5G network in any region. Regions specifically mentioned are North America, Korea, Japan, Europe, and Australia. Qualcomm also boasts a fast time-to-certification and launch for device OEMs, so it shouldn’t be too long before we see the Snapdragon X55 make its way to devices. It’s not just for smartphones either—Qualcomm mentions Always Connected PCs, laptops, tablets, fixed wireless access points, extended reality devices, and automotive applications. The Qualcomm Snapdragon X55 Modem is expected to reach commercial devices by late 2019. The Qualcomm Snapdragon X24 4G modem promised maximum theoretical download speeds of up to 2Gbps, and could even maintain high speeds on congested networks thanks to a combination of 7X carrier aggregation, 4×4 MIMO on a maximum of five aggregated LTE carriers, License Assisted Access, FD-MIMO, and other technologies. But 5G-capable modems like the new Qualcomm Snapdragon X55 will be capable of maximum theoretical download speeds of up to 20Gbps—10 times the speed of what the Snapdragon X24 offered. How Do We Make It Mobile” by Qualcomm. 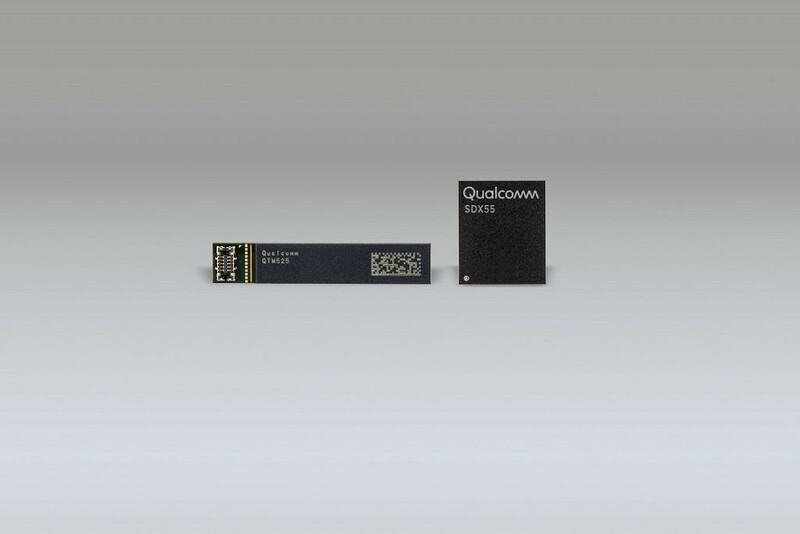 To bypass those challenges, Qualcomm has launched its second generation of RF front-end (RFFE) solutions for 5G multi-mode devices. This new solution should aid OEMs in accelerating their time-to-launch, while also increasing battery life, call reliability and data speeds. This newly announced RFFE solution includes the QTM525 mmWave antenna module. 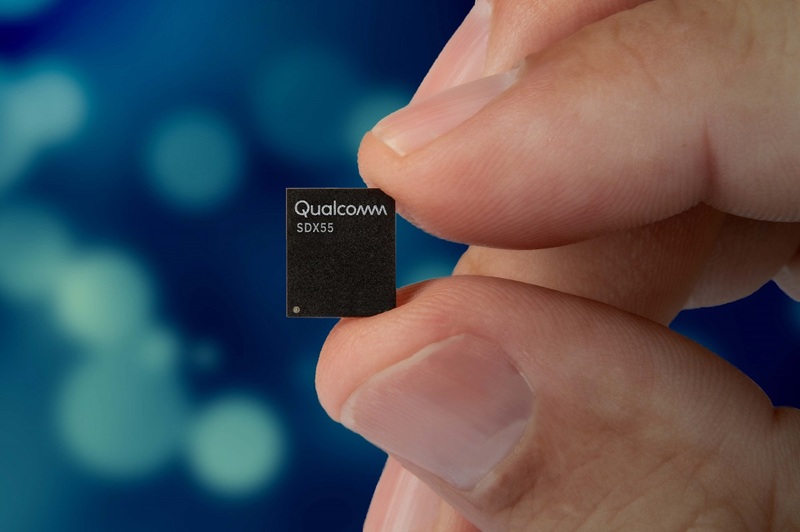 Qualcomm also announced the QET6100 envelope tracker, which supports 100Mhz of 5G bandwidth. The QAT3555 Signal Boost adaptive antenna tuner was also launched to combat the ever-growing concerns about the poor signal reception of our mobile devices. mmWave describes the frequencies in which the fastest 5G speeds will be attainable from network providers. The only problem with that is the geographical distance it can cover is a lot less, so mmWave will really only be implemented in densely populated urban centers. That’s where the need for sub-6GHz comes from in rural areas – it’ll cover greater distances, at the cost of having a lower throughput. 4G also operates in a frequency below 6GHz, so the ultimate goal is that both networks would co-exist in the same frequency, with dynamic spectrum sharing allowing network providers to faster roll out 5G networks. That’s why the new mmWave antenna module, QTM525, is important. It’s a single-chip, 14-nanometer transceiver for 5G, and it supports both mmWave at 26GHz, 28GHz, 39GHz, and even sub-6GHz. It’s less than 8mm in thickness, so adding multiple of these antenna modules shouldn’t make phones noticeably thicker. While 5G is coming, the technology is very much in its infancy and it will be a long time before it’s commercially viable to be used entirely over 4G in the majority of scenarios. Qualcomm intends to demonstrate the technology at this year’s MWC 2019 in Barcelona, in order to showcase its roadmap and the use cases that 5G has. “We continue to drive new technology innovations forward that will usher in new levels of performance and efficiency and broader use of 5G NR technology,” said John Smee, vice president of engineering at Qualcomm Technologies, Inc. Qualcomm will be showing off how the Snapdragon X50 modem can be used for cloud-based gaming, a system that companies have been working on perfecting over the years. Smartphones with support for 5G as well appear to be a whole lot more expensive, in the region of a couple of hundred dollars more in the case of OnePlus. With the advent of the Qualcomm Snapdragon X55 Modem, device manufacturers may be able to source its predecessor at a lower price, even if it is technically inferior. The future of 5G is exciting, and we’ll be keeping a close eye on it. Qualcomm has improved its testing facilities so that they can validate new 3GPP Release 16+ designs ahead of standardization, so we can expect even more improvements in the future.